Expat life in the Arabian Gulf is a lot like high school: necessity is the mother of all friendships. 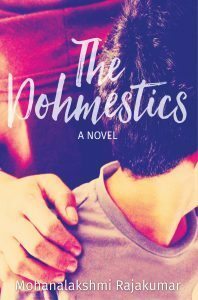 The Dohmestics explores the ups and downs of six women thrown together by fate in the quintessential Middle Eastern compound; a neighborhood enclosed by a boundary wall with a security gate. Emma, Nouf, Rosa, and Maya are part of the sophomoric fishbowl no one can escape,where rumors can ruin marriages or jobs. Daily life is an array of coffee mornings, book clubs, and single parenting for Emma whose pilot husband is away more than at home. She can barely remember the workaholic professional she was before becoming a trailing spouse. she wants to establish an identity of her own. Rosa was the regional winner of a beauty pageant in the Philippines. Now, she is a full time maid and nanny for a family who treats her well. But will sacrificing her future for her sisters’ be worth it? Country girl Lillie is fired a few months into her first job as a housemaid. She can’t go back home; too many people need her income. Without a reference, no one will employ her. Maya, a seamstress in Sri Lanka, lost everything in the Asian tsunami. She bears her tyrannical boss’ demands, in hopes of rebuilding a life back home. Amira, the compound’s unofficial head cheerleader, appears to have it all. Yet, as everyone knows, because each is desperately trying to hide her own: we all have secrets.